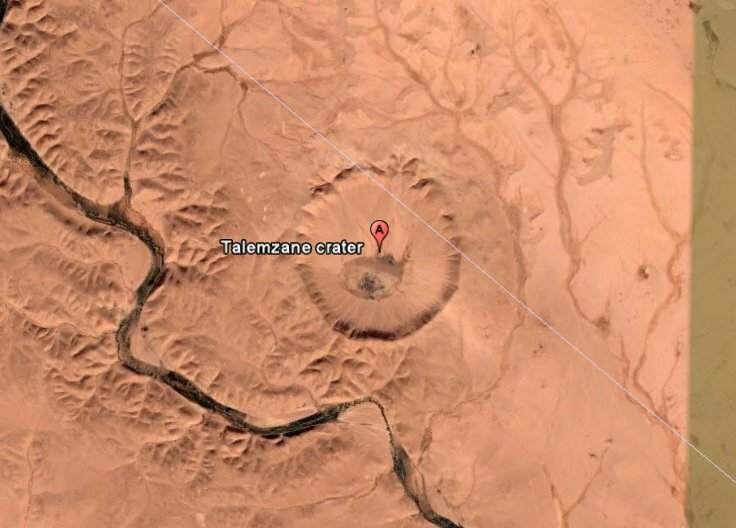 The Talemzane crater (locally named: Crat?re de Maadna) is located Algeria, 120km southeast of Laghouat. 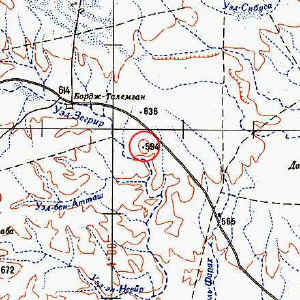 The crater is 1.75km in diameter and 70m deep. The crater has a raised rim that is made up of outward dipping limestones. The crest of the rim is made up of large, disoriented limestone blocks, ranging in size from 1m to 10m. The target rocks in the area are limestones, and they compose the crater walls. In many places the limestone has been brecciated, and the blocks are upturned almost vertically. Several highly fractured zones are observed in these crater walls, as are brecciated rocks. There is an abundance of breccia veins in the crater walls. These veins are usually parallel or perpendicular to the strata. The veins differ in distribution and thickness, with some veins as thick as 1m. These veins are filled with a breccia with sub-angular limestone clasts as wide as 10cm, and a calcite cement. In the lower parts of the crater walls, the limestones are intensely fractured, and grade into a monomict breccia. This breccia can also be found outside of the crater, extending about 500m past the rim. At the foot of the crater wall is a polymict breccia made up of limestone clasts from different layers that show different stages of weathering. The cement in this polymict breccia is also calcite, and forms up to 50% of the breccia. The center of the crater is partially filled with alluvial sands and clays. 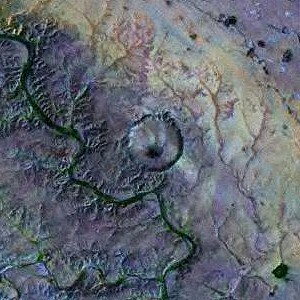 There is petrographic evidence for Talemzane's impact origin. Thin sections cut from several different rocks have revealed planar elements in quartz, sometimes accompanied by fluid inclusions. Although no other evidence of shock metamorphism has been found, planar elements in quartz are a fairly conclusive sign of an impact event. The age of Talemzane is hard to estimate. While the crater is somewhat eroded, the presence of an ejecta blanket suggests that the age is not too old. However, the crater postdates Pliocene folding of the local rocks. The age has been roughly constrained to between 3 million and 0.5 million years.